These products are part of a fundraiser for the We Are Woman March on Washington, D.C. We have only added $5.00 to the wholesale price. Each purchase will contribute $5.00 directly to expenses for the march. We've used CafePress because it requires no upfront money from us and they only print when an item is ordered. We appreciate your help with our cause and hope to see you in Washington for the march! To see all items in our shop visit: We Are Woman Shoppe Thank you! 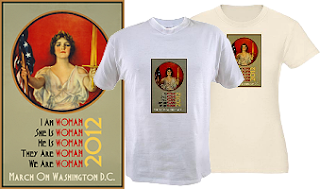 Shirts to show your solidarity with the We Are Woman march on Washington, D.C., September, 2012.